Humor & awkward moments by Zero Dean based on weird thoughts & real-life experiences often presented in webcomic format. That awkward moment I think I should tell you I’ve been drinking. Not a lot, mind you. And it was just water. But still. I feel it’s important that you know and appreciate how hydrated I am. Hydrated. It’s the new humble. There’s a pretty good chance that I’m more hydrated than you are. 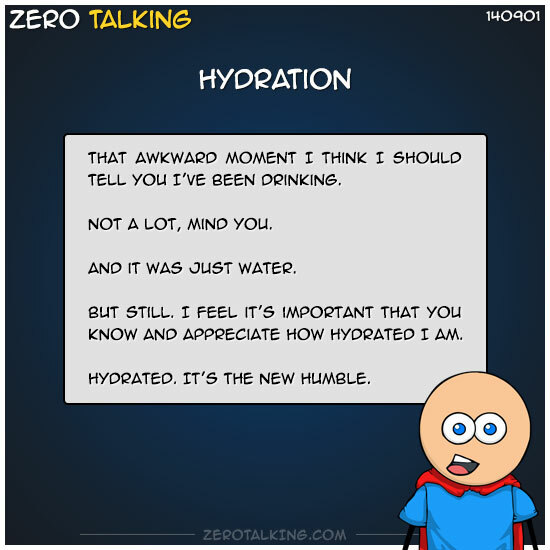 Unless you hydrate yourself professionally. I’m so hydrated, when fish see me, they wonder if we’re related. And then I joke with them and say, yes, we are related. And then I get invited to fish parties where half the fish forget who I am every time they turn around. Because they have really short term memories. So I have to keep introducing myself. Fish parties aren’t that much fun, actually. And then I just walk away. I’m so hydrated that sometimes I sweat liquid. Like when it’s hot. Or I’m sitting on a *fake leather seat cushion. *Genuine imitation leather. Excuse me. In all seriousness, let my posts about hydration be a reminder that most people don’t drink nearly enough water every day. Coffee, alcoholic beverages, energy drinks, carbonated beverages, and pretty much anything that isn’t _just_ water doesn’t count (so much). So drink up and hydrate, yo. Dear Life, I love you. A life lived for art is never wasted. When something goes wrong in your life, just yell "Plot twist!" and move on. Click here for details about my new book.